International researchers have collaborated on the creation of biocompatible electrodes that could be used to treat neurological disorders including epilepsy. Klas Tybrandt, principal investigator at the Laboratory of Organic Electronics at Linköping University, Sweden, led the development of the new technology for long-term stable neural recording, which is based on a novel elastic material composite that retains high electrical conductivity. The result – achieved in collaboration with colleagues at ETH Zürich, Columbia University, and New York University – is said to be crucial for numerous applications in biomedical engineering. The research is described in Advanced Materials. Coupling electronic components and nerve cells makes it possible to collect information about cell signalling, and helps to diagnose and treat neurological disorders and diseases such as epilepsy. Achieving long-term connections that do not damage neurons or tissue is challenging since the soft tissue of the body and hard electronic components have different mechanical properties. 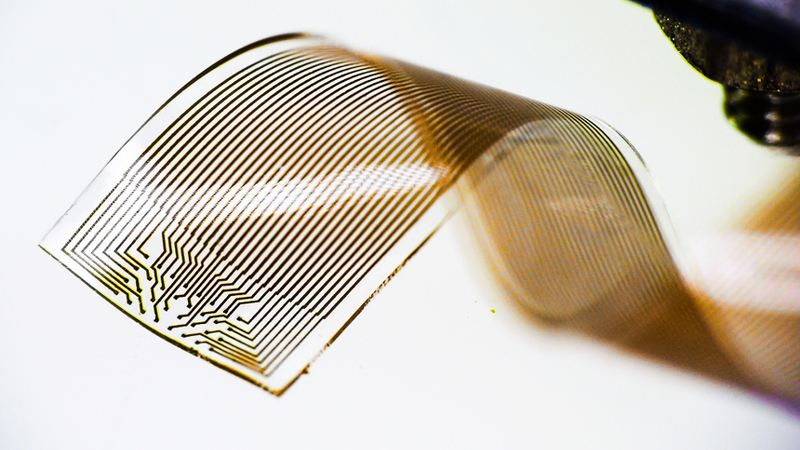 Tybrandt’s new conductive material is said to be as soft as human tissue and can be stretched to twice its length. The material consists of gold coated titanium dioxide nanowires embedded into silicone rubber. The material is biocompatible and its conductivity remains stable over time. The electrodes are 50µm in size and placed 200µm from each other. The fabrication procedure allows 32 electrodes to be placed onto a very small surface. The final probe (pictured above) has a width of 3.2mm and is 80µm thick. The soft microelectrodes have been developed at Linköping University and ETH Zürich, and researchers at New York University and Columbia University have subsequently implanted them in the brains of rats. The researchers were able to collect high-quality neural signals from the freely moving rats for three months. Tybrandt added that the advance could have other neurological applications, such as in brain-machine interfaces, where prostheses are controlled with the aid of neural signals.